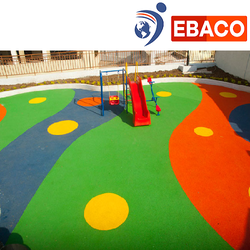 Ebaco offers super safe EPDM rubber surfaces for kids play area which is hygienic, safe and protect kids from critical head injuries. Thickness available - 10mm , 15mm , 20mm, 22mm. anytime 10mm stock is available. 10mm to 24 mm: 20" x 20"
EPDM rubber tiles suitable for play school, gym, outdoor ..
By keeping track of current market development, we provide Rubber Gym Flooring to our valuable clients. As per the needs of our clients, we also provide this floor in different sizes and designs. We have carved a niche amongst the most trusted names in this business, engaged in offering comprehensive range of EPDM Flooring. 100% vulcanized rubber for indoor sports. We offer a surface which is approved by FIBA, FIVB and IHF. Rubber is very environment friendly product and provides a very comfortable and shock absorbent surface. The surface provides excellent traction which is essential for sports. 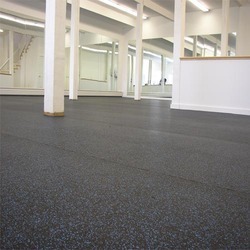 We provide the best in commercial rubber flooring and installation. Our commercial grade rubber flooring is slip-retardant and provides safety, durablity, and requires less maintenance than most other types of hard surface flooring. We are specilise in flooring systems. We are highly acknowledged organization engaged in presenting a remarkable range of PVC Rubber Flooring.